Picture - U.S. Army Air Forces Consolidated B-24D Liberator over Maxwell Field, Alabama. The Consolidated B-24 Liberator was an American heavy bomber, designed by Consolidated Aircraft Company of San Diego, California. 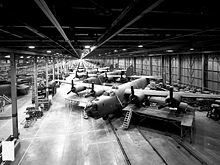 Its mass production was brought into full force by 1943 with the aid of the Ford Motor Company through its newly constructed Willow Run facility, where peak production had reached one B-24 per hour and 650 per month in 1944. Other factories soon followed. 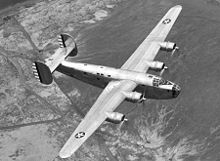 The B-24 ended World War II as the most produced Allied heavy bomber in history, and the most produced American military aircraft at over 18,000 units, thanks in large measure to Henry Ford and the harnessing of American industry. It still holds the distinction as the most-produced American military aircraft. 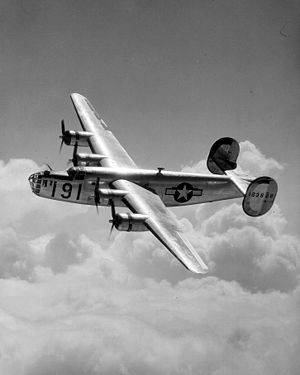 The B-24 was used by several Allied air forces and navies, and by every branch of the American armed forces during the war, attaining a distinguished war record with its operations in the Western European, Pacific, Mediterranean, and China-Burma-India Theaters. Often compared with the better-known B-17 Flying Fortress, the B-24 was a more modern design with a higher top speed, greater range, and a heavier bomb load; however, it was also more difficult to fly, with heavy control forces and poor formation-flying characteristics. Popular opinion among aircrews and general staffs tended to favor the B-17's rugged qualities above all other considerations in the European Theater. The placement of the B-24's fuel tanks throughout the upper fuselage and its lightweight construction, designed to increase range and optimize assembly line production, made the aircraft vulnerable to battle damage. The B-24 was notorious among American aircrews for its tendency to catch fire. Moreover, its high fuselage-mounted Davis wing also meant it was dangerous to ditch or belly land, since the fuselage tended to break apart. Nevertheless, the B-24 provided excellent service in a variety of roles thanks to its large payload and long range. 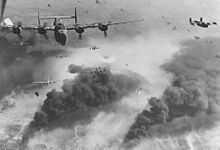 The B-24's most famous mission was the low-level strike against the Ploesti oil fields, in Romania on 1 August 1943, which turned into a disaster due to attack waves getting out of sequence. The Liberator originated from a United States Army Air Corps (USAAC) request in 1938 for Consolidated to produce the B-17 under license. This was part of "Project A", a program to expand American industrial capacity for production of the key components of air power. After company executives including President Reuben Fleet visited the Boeing factory in Seattle, Consolidated decided instead to submit a more modern design of its own. In January 1939, the USAAC, under Specification C-212, formally invited Consolidated to submit a design study for a bomber with longer range, higher speed, and greater ceiling than the B-17. The contract for a prototype was awarded in March 1939, with the requirement that one should be ready before the end of the year. The design was simple in concept but nevertheless advanced for its time. Compared to the B-17, the proposed Model 32 was shorter with 25% less wing area, but had a 6 ft (1.8 m) greater wingspan and a substantially larger carrying capacity, as well as a distinctive twin tail. Whereas the B-17 used 9-cylinder Wright R-1820 Cyclone engines, the Consolidated design used twin-row, 14-cylinder Pratt & Whitney R-1830 "Twin Wasp" radials of 1,000 hp (746 kW). The 70,547 lb (32,000 kg) maximum takeoff weight was one of the highest of the period. Consolidated incorporated innovative features: the new design would be the first American bomber to use tricycle landing gear, and it had long, thin wings with the efficient "Davis" high aspect ratio design (also used on the projected Model 31 twin-engined commercial flying boat) promising to provide maximum fuel efficiency. Wind tunnel testing and experimental programs using an existing Consolidated Model 31 provided extensive data on the flight characteristics of the Davis airfoil. Consolidated finished the prototype, by then known as the XB-24, and had it ready for its first flight two days before the end of 1939. Seven more YB-24 development aircraft flew in 1940 and Consolidated began preparing production tooling. Early orders-placed before the XB-24 had flown-included 36 for the USAAC, 120 for the French Arm�e de l'Air and 164 for the Royal Air Force (RAF). Most of the first production B-24s went to Great Britain, including all those originally ordered by the Arm�e de l'Air after France collapsed and surrendered in 1940. The name, "Liberator", was originally assigned to it by the RAF, and subsequently adopted by the USAAF as the official name for the type. The B-24's spacious slab-sided fuselage (which earned the aircraft the nickname "Flying Boxcar") was built around a central bomb bay that could accommodate up to 8,000 lb (3,629 kg) of ordnance. The bomb bay was divided into front and rear compartments and had a central catwalk, which was also the fuselage keel beam. A universal complaint arose over the extremely narrow catwalk. The aircraft was sometimes disparaged as "The Flying Coffin" because the only entry and exit from the bomber was in the rear and it was almost impossible for the flight crew and nose gunner to get from the flight deck to the rear when wearing parachutes. An unusual set of "roller-type" bomb bay doors, which operated very much like the movable enclosure of a rolltop desk, retracted into the fuselage, creating a minimum of aerodynamic drag to keep speed high over the target area. Like the B-17, the B-24 had an array of .50 caliber (12.7 mm) M2 Browning machine guns in the tail, belly, top, sides and nose to defend it from attacking enemy fighters. However, unlike the B-17, the ball turret could be retracted into the fuselage when not in use, a necessity given the low ground clearance of the fuselage. Picture - B-24L Stevonovitch II (AAF Ser. No. 44-49710) of the 464th BG, hit by 2 cm FlaK 30 while supporting ground troops near Lugo, Italy, 10 April 1945. Colonel James Gilson, commanding officer of the 779th BS and nine others were killed; one waist gunner was thrown clear and survived. Liberator GR Is in British service were the first B-24s to be used operationally. The very first use of Liberators in British service was the use of ex-USAAF YB-24s (designated LB-30A), which while not suitable for combat, were used as a long-range transport, operating the Atlantic Return Ferry Service, returning the civilian ferry pilots who delivered aircraft such as the Lockheed Hudson across the Atlantic back to Canada. The most important role for the first batch of the Liberator GR Is was in service with RAF Coastal Command on anti-submarine patrols in the Battle of the Atlantic. Later in 1941, the first Liberator IIs entered RAF service. This model introduced self-sealing fuel tanks and powered gun turrets. At the same time, Consolidated added a 2 ft 7 in (79 cm) plug in the forward fuselage to create more space for crew members. The Liberator IIs were divided between Coastal Command, Bomber Command, and BOAC. Two RAF squadrons with Liberators were deployed to the Middle East in early 1942, in the first use of the Liberator as a bomber. The United States Army Air Forces (USAAF) took delivery of its first B-24As in 1941. The sole B-24 in Hawaii was destroyed by the Japanese attack on Pearl Harbor on 7 December 1941. Like the RAF, the USAAF used them as transports at first. American B-24s entered combat service in 1942 when on 6 June, four B-24s from Hawaii staging through Midway Island attempted an attack on Wake Island, but were unable to find it. On 12 June 1942, 13 B-24s flying from Egypt attacked the Axis-controlled oil fields and refineries around Ploesti, Romania. Over the next three years, B-24 squadrons deployed to all theaters of the war: African, European, China-Burma-India, the Battle of the Atlantic, the Southwest Pacific Theater and the Pacific Theater. In the Pacific, the B-24 (and its twin, the U.S. Navy PB4Y Privateer) was eventually designated as the standard heavy bomber to simplify logistics and to take advantage of their longer range, replacing the shorter-range B-17 which had served early in the war along the perimeter of the Pacific from the Philippines, Australia, Espiritu Santo, Guadalcanal, Hawaii, and during the Battle of Midway from Midway Island. The first mass-produced model was the B-24D (Liberator III in British service), entering service in early 1943. It had turbocharged engines and increased fuel capacity. Three more 0.50 caliber (12.7 mm) machine guns brought the defensive armament up to 10 machine guns. At 59,524 lb (27,000 kg) maximum takeoff weight, it was one of the heaviest aircraft in the world; comparable with the British "heavies" the Stirling, Lancaster and Halifax. 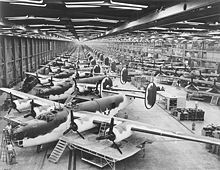 Production of B-24s increased at an astonishing rate throughout 1942 and 1943. Consolidated Aircraft tripled the size of its plant in San Diego and built a large new plant outside Fort Worth, Texas. More B-24s were built by Douglas Aircraft in Tulsa, Oklahoma. North American Aviation built a plant in Dallas, Texas, which produced B-24Gs and B-24Js. None of these were minor operations, but they were dwarfed by the vast new purpose-built factory constructed by the Ford Motor Company at Willow Run near Detroit, Michigan. Ford broke ground on Willow Run in the spring of 1941, with the first plane coming off the line in October 1942. It had the largest assembly line in the world (3,500,000 ft�/330,000 m�). At its peak, the Willow Run plant produced 650 B-24s per month in 1944. By 1945, Ford made 70% of all B-24s in two nine-hour shifts. Pilots and crews slept on 1,300 cots at Willow Run waiting for their B-24s to roll off the assembly line. At Willow Run, Ford produced half of 18,000 total B-24s. Each of the B-24 factories was identified with a production code: Consolidated/San Diego, CO; Consolidated/Fort Worth, CF; Ford/Willow Run, FO; North American, NT; and Douglas/Tulsa, DT. In 1943, the model of Liberator considered by many the "definitive" version was introduced. The B-24H was 10 in (25 cm) longer, had a powered gun turret in the upper nose to reduce vulnerability to head-on attack and was fitted with an improved bomb sight, autopilot, and fuel transfer system. Consolidated, Douglas and Ford all manufactured the B-24H, while North American made the slightly different B-24G. All five plants switched over to the almost identical B-24J in August 1943. The later B-24L and B-24M were lighter-weight versions and differed mainly in defensive armament. As the war progressed, the complexity of servicing the Liberator continued to increase. The B-24 variants made by each company differed slightly, so repair depots had to stock many different parts to support various models. Fortunately, this problem was eased in the summer of 1944, when North American, Douglas, and Consolidated Aircraft at Fort Worth stopped making B-24s, leaving only the Consolidated plant in San Diego and the Ford plant in Willow Run. In all, 18,482 B-24s were built by September 1945. Twelve thousand saw service with the USAAF. The U.S. Navy operated about 1,000 PB4Y-1s, and almost 800 PB4Y-2 Privateers which were derived from the B-24. The Royal Air Force flew about 2,100 B-24s in 46 bomber groups and 41 squadrons; the Royal Canadian Air Force 1,200 B-24Js; and the Royal Australian Air Force (RAAF) 287 B-24Js, B-24Ls, and B-24Ms. Liberators were the only heavy bomber flown by the RAAF in the Pacific. Two squadrons of the South African Air Force based in Italy flew B-24s. The B-24 was one of the workhorse bombers of the U.S. Eighth Air Force in the Combined Bomber Offensive against Germany, forming about one-third of its heavy bomber strength, with the other two-thirds being B-17s. 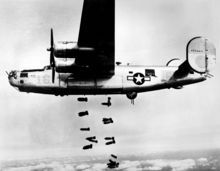 Thousands of B-24s, flying from bases in England, dropped hundreds of thousands of tons of bombs and incendiaries on German military and industrial targets. The 44th Bombardment Group was one of the first two heavy bombardment groups flying the B-24 with the 8th Air Force in the fall/winter air campaigns in the European Theater of Operations. The 44th Bomb Group flew the first of its 344 combat missions against the Axis powers in World War II on 7 November 1942. Picture - 15th Air Force B-24s fly through flak and over the destruction created by preceding waves of bombers. 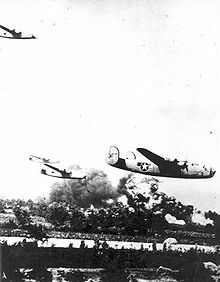 B-24s of the Ninth Air Force, operating from Africa and Italy, and the Fifteenth Air Force, also operating from Italy, took a major role in strategic bombing. Fifteen of the 15th AF's 21 bombardment groups flew B-24s. The Ninth Air Force moved to England in 1944 to become a tactical air force, and all of its B-24s were transferred to other Air Forces, such as the Fifteenth Air Force in Italy. The fire spread out along the right wing. The inboard propeller windmilled to a stop. And then, suddenly, the whole wing broke off. At an altitude of 900 metres there was a tremendous explosion. The bomber had disintegrated. The blazing wreckage landed just outside Bad Zwischenahn airfield. A total of 178 B-24s carried out the famous second attack on Ploesti (Operation Tidal Wave) on 1 August 1943, flying from their bases in northwestern Libya. In late June 1943, the three B-24 Liberator groups of the 8th Air Force were sent to North Africa on temporary duty with the 9th Air Force. The 44th Bomb Group was joined by the 93rd and the 389th Bomb Groups. These three units joined the two 9th Air Force B-24 Liberator groups for the 1 August 1943 low-level attack on the German-held Romanian oil complex at Ploesti. This daring and bold assault by high altitude bombers at tree top level was an experience that had both successes and failures. The 44th destroyed both of its assigned targets, but lost 11 of its 37 bombers and their crews. Colonel Leon W. Johnson, the group commander who led the mission, was awarded the Medal of Honor for his leadership. For its actions on the Ploesti mission, the group was awarded its second Distinguished Unit Citation. Of the 178 B-24s that were dispatched on this operation, 54 were lost. RAF Bomber Command did not use B-24s as bombers over Europe. No. 223 Squadron RAF, one of Bomber Command’s 100 (Bomber Support) Group squadrons, used 20 Liberator VIs to carry electronic jamming equipment to counter German radar. Liberators were also used as anti-submarine patrol aircraft by the RAF. The B-24's long operating range made it suitable for other duties including maritime patrol, anti-submarine patrol, reconnaissance, tanker, cargo hauler, and personnel transport. Winston Churchill used a refurbished Liberator II as his personal transport aircraft. In February 1944, the 2nd Division authorized the use of war-weary aircraft specially fitted to aid assembly of individual group formations. Known as Assembly or Formation Ships, they were equipped with signal lighting, provision for quantity discharge of pyrotechnics, and featured distinctive individual paint schemes of psychedelic colors in stripes, checkers, or polka dots to enable easy recognition by their flock of bombers. The aircraft used in the first allocation were B-24Ds retired by the 44th, 93rd and 389th Groups. Arrangements for signal lighting varied from group to group, but generally consisted of white flashing lamps on both sides of the fuselage arranged to form the identification letter of the group. All armament and armor was removed, and in some cases the tail turret. In the B-24Hs used for this purpose, the nose turret was removed and replaced by a "carpetbagger" type nose. Following incidents when flare guns were accidentally discharged inside the rear fuselage, some Formation Ships had pyrotechnic guns fixed through the fuselage sides. As these aircraft normally returned to base once a formation had been established, a skeleton crew of two pilots, navigator, radio operator and one or two flare discharge men were carried. In some groups an observer officer flew in the tail position to monitor the formation. These aircraft became known as Judas Goats. From August 1943 until the end of the war in Europe, specially modified B-24Ds were used in classified missions. 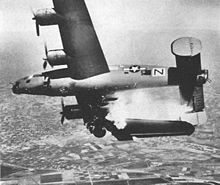 In a joint venture between the Army Air Force and the Office of Strategic Services (OSS) code named "Operation Carpetbagger", pilots and crews flew specially modified B-24Ds painted with a glossy black anti-searchlight paint to supply friendly underground forces throughout German occupied Europe. They also flew C-47s, A-26 Invaders, and British de Havilland Mosquitos. They flew spies called "Joes" and commando groups prior to the Allied invasion of Europe on D-Day and afterward, and retrieved over 5,000 officers and enlisted men who had escaped capture after being shot down. The low-altitude, night-time operation was extremely dangerous and took its toll on these airmen. The first aircrews chosen for this operation came from the anti-submarine bomb groups because of their special training in low altitude flying and pinpoint navigation skills. Also, because of their special skills, they were called upon to fly fuel to General George Patton's army when it outran its fuel supply. When this mission was completed, it was recorded that 822,791 gal (3,114264 L) of 80 octane gasoline had been delivered to three different airfields in France and Belgium. Picture - B-24 Very Long Range Liberators at the Consolidated-Vultee Plant, Fort Worth, Texas in the foreground with the dark green and white paint scheme. To the rear of this front line are C-87 "Liberator Express Transports" in various assembly stages. The Liberators made a great contribution to Allied victory in the Battle of the Atlantic against German U-boats. The decision to allocate some Liberator Is to Coastal Command in 1941 to patrol the eastern Atlantic Ocean produced immediate results. The Very Long Range (VLR) Liberators "almost doubled the reach of Britain's maritime reconnaissance force". This extended range enabled Coastal Command patrols to cover part of the mid-Atlantic gap, where U-boats had operated without risking being attacked and sunk by Allied aircraft. For 12 months, No. 120 Squadron RAF of Coastal Command with its handful of much-patched and modified early model Liberators, supplied the only air cover for convoys in the Atlantic Gap, the Liberator being the only warplane with sufficient range. The VLR Liberators sacrificed some armor and often gun turrets in order to save weight, while carrying extra aviation gasoline in their bomb-bay tanks. Liberator Is were equipped with ASV (Air to Surface Vessel) Mark II radar, which together with the Leigh light gave them the ability to hunt U-boats by day and by night. These Liberators operated from both sides of the Atlantic with the Royal Canadian Air Force and the U.S. Navy from the west; and with the RAF from the east, based in Northern Ireland, Scotland, Iceland, and beginning in mid-1943 from the Azores. This role was dangerous, especially after many U-boats were armed with extra anti-aircraft guns, some adopting the policy of staying on the surface to fight, rather than submerging and risking being sunk by ASW (anti-submarine warfare) torpedoes and depth charges from the bombers. 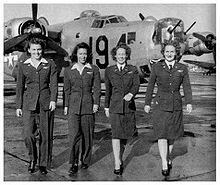 In addition to flying from the East Coast of the United States, American Liberators flew from Greenland, the Azores, Bermuda, the Bahamas, Puerto Rico, Cuba, Trinidad, and from wherever else they could fly far out over the Atlantic. The rather sudden and decisive turning of the Battle of the Atlantic in favor of the Allies in May 1943 was the result of many factors. However, it was no accident that it coincided with the long delayed arrival of many more VLR Liberators for maritime patrols. Liberators were credited in full or in part with 72 U-boat sinkings. 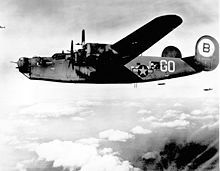 In addition to very long range patrols, the B-24 was vital for patrols of a radius less than 1,000 mi (1,600 km), in both the Atlantic and Pacific theaters where U.S. Navy Privateers and USAAF B-24s took a heavy toll of German and Japanese submarines, and also some Japanese surface shipping. The Consolidated Aircraft Company PB4Y Privateer was a World War II U.S. Navy patrol bomber that was derived directly from the B-24 Liberator. The U.S. Navy had been using unmodified B-24s as the PB4Y-1 Liberator, and this type of patrol plane was considered to be quite successful. 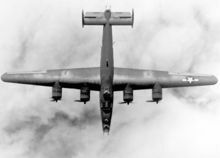 However, a fully navalized design was advantageous, and Consolidated Aircraft developed a purpose-built long-range patrol bomber in 1943, designated PB4Y-2 Privateer, that was visually distinguishable from the B-24 and PB4Y-1 by having a single vertical stabilizer rather than a twin tail. Early model Liberators were used as unarmed long-range cargo carriers. They flew between Britain and Egypt (with an extensive detour around Spain over the Atlantic), and they were used in the evacuation of Java in the East Indies. Liberator IIs were converted for this role and were used by the British Overseas Airways Corporation (BOAC) for trans-Atlantic services and other various long-range air transportation routes. This version of the Liberator was designated the LB-30A by the USAAF. By early 1943, the need for a transport with better high altitude performance and longer range than the Douglas C-47 Skytrain had become pressing. A transport version of the B-24 was proposed, and soon afterward, a B-24D that had been damaged in an accident was converted into a cargo aircraft by elimination of its transparent nose and the installation of a flat cargo floor. In April 1943, the C-87 Liberator Express transport entered production at Fort Worth, Texas. The C-87 had a large cargo door, less powerful supercharged engines, no gun turrets, a floor in the bomb bay for freight, and some side windows. The navigator's position was relocated behind the pilot. Early versions were fitted with a single .50 caliber (12.7 mm) Browning machine gun in their tails, and a few C-87s were also equipped with two .50 caliber (12.7 mm) fixed machine guns in their noses, operable by the pilot, though these were eventually removed. A more dedicated VIP transport, the C-87A, was also built in small numbers. The C-87 was also designated the RY-2 or Liberator Cargo VII. Although only 287 C-87 and RY variants were produced, they were still important in the Army Air Force's airlift operations early in the war when aircraft with high altitude, long-range heavy hauling abilities were in short supply. The C-87 flew in many theaters of war, including much hazardous duty in flights from Labrador to Greenland and Iceland in the North Atlantic. In the China Burma India Theater (CBI), the C-87 was used to airlift cargo and fuel over the Hump (the Himalayas) from India to China. Early in the campaign, the C-87 was the only readily available American transport that could fly over the Himalayas while heavily loaded, rather than relying on circuitous and highly dangerous routes through valleys and mountain passes. The C-87 was not very popular with the aircrews assigned to fly it. The aircraft had the distressing habit of losing all cockpit electrical power on takeoff or at landings, while its engine power and reliability with the less-powerful superchargers often left much to be desired. It proved to be quite vulnerable to icing conditions, and was prone to fall into a spin with even small amounts of ice accumulated onto its Davis wing. Since the aircraft had been designed to be a bomber that dropped its loads while airborne, the C-87's nose landing gear was not designed for landing with a heavy load, and frequently it collapsed from the stress. Fuel leaks inside the crew compartment from the hastily modified long-range fuel system were an all-too-common occurrence. Lastly, unlike a typical purpose-designed transport, the B-24 was not designed to tolerate large loading variations because most of its load was held on fixed bomb racks. Consequently, it was far too easy for a poorly trained ground crew to load a C-87 with its center of gravity too far forward or aft, rendering the aircraft longitudinally unstable and difficult to control. In his autobiography, Fate is the Hunter, the writer Ernest K. Gann reported that, while flying air cargo in India, he barely avoided crashing an improperly loaded C-87 into the Taj Mahal. As soon as more dependable Douglas C-54 Skymaster and Curtiss-Wright C-46 Commando transports became available in large numbers, C-87s were rapidly phased out of combat zone service, with some later used as VIP transports or B-24 flight crew trainers. The C-109 was a dedicated fuel transport version of the B-24 conceived as a support aircraft for B-29 Superfortress operations in central China. Unlike the C-87, the C-109 was not built on the assembly line, but rather was converted from existing B-24 bomber production; to save weight, the glass nose, armament, turret fairings and bombardment equipment were removed. Several storage tanks were added, allowing a C-109 to carry almost 2,905 gal (11,000 L) of fuel weighing over 22,000 lb (10,000 kg). Plans originally called for 2,000 C-109s to support 10 groups of B-29s (approximately 400) in China, but the capture of the Mariana Islands provided a far more easily resupplied location for raids on mainland Japan, and the plans were greatly scaled back. Only 218 C-109s were actually converted. After the transfer of the B-29s, the C-109s were reassigned to the Air Transport Command. According the history of the US Army Air Forces in World War II, at least one squadron was assigned to the IX Troop Carrier Command in Europe to transport gasoline to advancing ground and air forces on the Continent after the Normandy invasion. However, whereas a combat-loaded B-24 could safely take off with room to spare from a 6,000 ft (1,800 m) runway, a loaded C-109 required every foot of such a runway to break ground, and crashes on takeoff were not uncommon. The aircraft demonstrated unstable flight characteristics with all storage tanks filled, and proved very difficult to land fully loaded at airfields above 6,000 ft (1,830 m) MSL in elevation, such as those around Chengdu. After it was discovered that these problems could be alleviated by flying with the forward storage tank empty, this practice became fairly routine, enhancing aircrew safety at the cost of some fuel-carrying capacity. Many C-109s were lost in flying the Hump airlift to China. In June 1944, Qantas Empire Airways began service with the first of two converted Liberators on the Perth to Colombo route to augment Consolidated PBY Catalinas that had been used since May 1943. This route across the Indian Ocean was 3,513 mi (5,654 km) long, the longest non-stop airline route in the world at the time. The Liberators flew a shorter 3,077 mi (4,952 km) over-water route from Learmonth to an airfield northeast of Colombo, but they could make the flight in 17 hours with a 5,500 lb (2,495 kg) payload, whereas the Catalinas required 27 hours and had to carry so much auxiliary fuel that their payload was limited to only 1,000 lb (454 kg). The route was named Kangaroo Service and marked the first time that Qantas' now-famous Kangaroo logo was used; passengers received a certificate proclaiming them as members of The Order of the Longest Hop. The Liberators were later replaced by Avro Lancastrians. The B-24 was operated by the German secret operations unit KG 200, which also tested, evaluated and sometimes clandestinely operated captured enemy aircraft during World War II. Only one B-24 was officially delivered to the USSR according to the Lend-Lease agreements, stranded in Yakutsk while flying a government mission to the Soviet Union in November 1942. In addition, 73 Liberators of various models that had force-landed in Europe airfields were recovered and 30 of them were repaired and used by the 45th BAD. Six examples were sent to Great Britain under Lend-Lease, designated LB-30A. Picture - B-24Ds of 93rd Bomb Group in formation. Nearest aircraft is Joisey Bounce (s/n 41-24226), wingman is The Duchess, (s/n 41-24147), and next higher is Bomerang (s/n 41-23722). First model produced on a large scale; ordered from 1940 to 1942, as a B-24C with better engines (R-1830-43 supercharged engines). The D model was initially equipped with a remotely operated and periscopically sighted Bendix belly turret, as the first examples of the B-17E Flying Fortress had used, but this proved unsatisfactory in service and was discontinued after the 287th aircraft. Production aircraft reverted to the earlier manually operated "tunnel" mounting with a single .50 caliber (12.7 mm) machine. The tunnel gun was eventually replaced by the retractable Sperry ball turret, which had also been adopted by the later B-17E Fortresses. In late B-24Ds, "cheek" guns were added. (Total: 2,696: 2,381 Consolidated, San Diego; 305 Consolidated, Fort Worth; 10 Douglas, Tulsa, Oklahoma). A number of worn-out B-24D and B-24Js were converted as radio-controlled flying bombs to attack German targets. Joseph P. Kennedy, Jr. was killed in a BQ-8 during Operation Aphrodite. 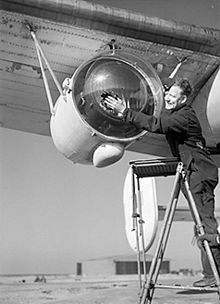 Picture - Anti-Submarine Weapons: Leigh light used for spotting U-boats on the surface at night, fitted to a Liberator aircraft of Royal Air Force Coastal Command. 26 February 1944. India A total of 42 B-24s recovered from aircraft dumps and restored by HAL were operational with No.5, No.6 and N.16 Squadrons. There are two flying Liberators: a B-24J named Witchcraft of the Collings Foundation in Stow, Massachusetts, and a B-24A renamed Ol' 927 (ex Diamond 'Lil'), of the Commemorative Air Force kept at Addison, Texas. Ol' 927 was the 25th Liberator built, originally a B-24A but rolled off the assembly line as an LB-30, Consolidated's designation indicating the 30th in the company's series of "license-built" designs for European customers. Complete with a bomb bay and machine gun positions, Ol' 927 was never delivered to Europe and instead served as a trainer and then a transport in the U.S. The CAF returned the aircraft to a B-24A configuration. Twelve complete B-24 airframes (6 B-24s and 6 PB4Ys) on static display in the United States. Five complete B-24 airframes on static display outside of the U.S.
Fifteen known partial airframes (12 B-24s, 1 British Liberator II and 2 PB4Ys) in the world. Eleven wrecked airframes (4 B-24s, 7 PB4Ys). However, it is also known that hundreds of B-24 wrecks lie at the bottoms of oceans, lakes, and rivers around the world. Picture - B-24 photographed from above, showing the Davis wing design. American Senator and 1972 presidential candidate George McGovern served as a B-24 pilot in missions over Italy as a member of the 455th Bomb Group of the Fifteenth Air Force; his wartime exploits and some of the characteristics of the B-24 are the focus of Stephen Ambrose's book The Wild Blue. Brigadier General Jimmy Stewart USAF Reserve, flew B-24s as commanding officer of the 703rd BS, 445th BG out of RAF Tibenham, UK, before a promotion to operations officer of the 453rd BG. 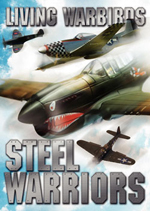 From 1943 to 1944, Stewart was credited with 20 combat missions as a pilot, including one over Berlin. Stewart flew several more (possibly as high as 20 additional) uncredited missions, filling in for pilots as duties and space would allow. Stewart's leadership qualities were highly regarded; the men who served under him praised his coolness under fire. He entered service as a private in early 1941 and rose to the rank of colonel by 1945. Former Speaker of the House, Jim Wright, served as a B-24 bombardier in the Pacific. He recounts his experience in his book The Flying Circus: Pacific War-1943-as Seen Through a Bombsight. B-24J Lonesome Lady, 494th Bomb Group, 7th Air Force, piloted by Lt. Thomas Cartwright, was shot down 28 July 1945 over Kure, Japan. Eight crew members survived; Lt. Cartwright was taken to Tokyo for questioning, and the remaining seven were taken to the military police facility in Hiroshima, fifteen miles away. They died there nine days later, 6 August 1945, when the atomic bomb was dropped on the city. Film director Robert Altman was a B-24 co-pilot flying over 50 bombing missions in Borneo and the Dutch East Indies. War hero and Olympic runner Louis Zamperini served as a bombardier on B24D "Green Hornet" in 1943. The aircraft crashed into the Pacific Ocean. All crewmembers died except Zamperini and pilot Russel A. Philips who managed to survive on a life raft 47 days on the sea. Russell Johnson, The Professor from Gilligan's Island, earned the Purple Heart when his B-24 Liberator was shot down in the Philippines during a bombing run in March, 1945. The story of the "Lady Be Good" inspired a television movie titled The Sole Survivor (1970 film), with a B-25 Mitchell playing the B-24D role. In the young adult novel Under a War-Torn Sky, the main character Henry Forester co-pilots Out of the Blue, a U.S. B-24 Liberator serving in the Royal Air Force. The B-24 is featured in the classic novel Goodbye to Some by Gordon Forbes, a former pilot, who seems to know the foibles of the aircraft. Of special note is the characteristic "siphoning" during flight of fuel from the tanks in the wings, caused by a venturi effect of air passing over the wings, sometimes resulting in a mid-air explosion of the aircraft. 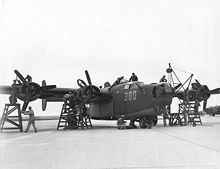 Picture - Maintenance mechanics at Laredo Army Air Field, Texas, give a Consolidated B-24 Liberator a complete overhaul before flight, 8 February 1944. Birdsall, Steve. Log of the Liberators. New York: Doubleday, 1973. 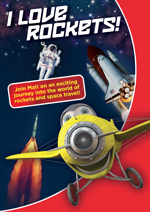 ISBN 0-385-03870-4. Bowman, Martin. The B-24 Liberator 1939-1945. Norwich, Norfolk, UK: Wensum Books Ltd, 1979. ISBN 0-903619-27-X. Freeman, Roger. Mighty Eighth War Manual. London: Jane's Publishing Company Limited, 1984. ISBN 0-71060-325-8. Gann, Ernest K. Fate Is The Hunter. New York: Simon & Shuster, 1986. ISBN 0-671-63603-0. Gordon, Yefim. Soviet Air Power in World War 2. Hinckley, Lancashire, UK: Midland, Ian Allan Publishing, 2008. ISBN 978-185780-304-4. Job, Macarthur. "Misadventure at Mauritius." Flight Safety Magazine, January-February 2000. Johnsen, Frederick A. B-24 Liberator: Combat and Development History of the Liberator and Privateer. Osceola, WI: Motorbooks International, 1993. ISBN 0-87938-758-0. Moyes, Philip J.R. Consolidated B-24 Liberator (Early Models). Kidlington, Oxford, UK: Vintage Aviation Publications Ltd., 1979. ISBN 0-905469-70-4. O'Leary, Michael. Consolidated B-24 Liberator. Botley, UK: Osprey Publishing, 2002. ISBN 1-84176-023-4. Parnell, Ben. Carpetbaggers America's Secret War in Europe. Austin, Texas: Eakin Press, 1987, revised edition 1993. 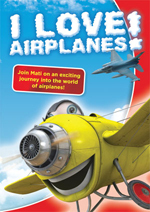 ISBN 978-0890155929. Robertson, Bruce. British Military Aircraft Serials: 1878-1987. Hinckley, Leicestershire, UK: Midland Counties Publications, 1998. ISBN 978-0904597615. Ward, Richard and Eric A. Munday. USAAF Heavy Bomb Group Markings & Camouflage 1941-1945, Consolidated Liberator. Reading, Berkshire, UK: Osprey Publishing Ltd., 1972. ISBN 0-85045-128-0. Weal, John. Bf 109 Defence of the Reich Aces. Oxford: Osprey, 2006. ISBN 1-84176-879-0. Wegg, John. General Dynamic Aircraft and their Predecessors. London:Putnam, 1990. ISBN 0-85177-833-X. Winchester, Jim. "Consolidated B-24 Liberator." 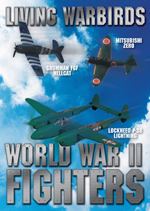 Aircraft of World War II: The Aviation Factfile. Kent, UK: Grange Books plc, 2004. ISBN 1-84013-639-1.